I know the policy of this board, like most, is to not permit advertisements for products in the messages. But this book is important to and should be of such interest to visitors to Nevada , I think it deserves to be posted here. If the board administrators disagree, they are free to remove this post, and if so hopefully will accept my apology for posting this. Disclosure: Bob Nersesian is my attorney on casino-related matters, and is a friend as well. Courts are run by men and women, and are, therefore, imperfect. And these imperfect men and women hold power bordering on the absolute when it comes to determining the scope of the authority of a gaming licensee and the police coming to their assistance. Still, over dozens of incidents, it has been rare in the extreme that a judge has prevented an advantage gambler from ultimately placing the core issues surrounding his complaints before a jury of citizens. If the fix was in, as I have been repeatedly told by members of the gambling community, then jury determinations would be unobtainable. The truth of the matter is that they are not. As mentioned, however, there are exceptions. The most egregious is presented in the determination by the Nevada Supreme Court that, in the process of an investigation, police officers possess discretion to intentionally fabricate evidence under Nevada law. Curiously, despite such a conclusion in one unpublished decision, this ruling has essentially been reversed in a published decision not involving a gambler (Jordan v. State). The next time such an issue arises, it may well turn out differently for the gambler. The overriding message that is taken from this book should be that there are rights and protections, and choosing to gamble does not strip a person of these rights and protections. These rights and protections, as with all intangible concepts, are in a state of flux and always will be. When a gaming licensee flexes its muscle gained through juice, connections, tax paying status, or whatever other method allows it to believe that it is a privileged citizen, the patron, be they a recreational patron, a high-roller, or an advantage gambler must insist on his rights and must pursue vindication. Absent such vigilant activity, the fluctuations in the protections and rights will ebb towards absolute casino power, and may eventually cascade in that direction. If this happens, then another truism about human nature will raise its ugly head. Absolute power corrupts absolutely. And if Nevada’s gaming industry truly becomes institutionally saturated with corruption, then the citizens will either be enslaved by the business interests, or the guests will stop coming, or both. Thus, it truly is incumbent upon readers to keep and protect your chosen way of life and recreation, to meet oppression head-on through legal and calm means, and to assure that Nevada or whatever gaming state is involved remains a government of laws and not a government of men. Throughout the book the reader will find anecdotal incidents based upon true occurrences, although oftentimes the names will be changed, as stated on Dragnet, in order to “protect the innocent.” There will also be a peppering of law addressing the scope of gaming regulation concerning patrons. You may find that the level of protection and rights granted the gambler astounds you. Likely, the ignorance of these rights by the very persons sworn to protect the gambler will leave you aghast. This book should be read by everyone who sets foot in a casino: average casino patrons, skilled players, casino employees, and anyone else. It should be required reading for police officers, regulators, other public officials, and attorneys who may represent any of the aforementioned. Bob Nersesian is an attorney who represents victims of casino wrongdoing against patrons. In an enjoyable writing style, he takes a look at the often too-cozy relationship between casinos, police, and regulators. He discusses specific cases and dispenses sound, practical advice that patrons, casinos and public officials would be wise to heed. Cases discussed are from Nevada and other jurisdictions. Chapters include: Your Money or Your Liberty; Scary Cop Statements; They'll Take Your Liberty Anyway; Gaming Agents Speak; The Take of the State; Rules for Casino Patrons; Gambling at the Legal Limits; Cops Hate Card Counters; Griffin Investigations; Casinos Cheat With Impunity; A Judicial and Government Overlay; Finding a Nickel Brings Trouble; Names and Aliases; The Security Office and Surveillance Functions, and Casinos and Cops. Appendices include Nevada Cheating and Detention Laws with Commentary; Other Nevada Gaming Laws of Interest; Gaming Cases of Interest, and Nevada Gaming Regulations with Commentary. The 320-page book includes a bibliography and an index. This sounds like a real downer to me. I don't go by the premise that the casinos hate us, I think that they are trying to protect themselves against a real criminal element out there. I have been in plenty of casinos and I have had some very good streaks at the tables, winning thousands in short times, and I have never felt threatened. In fact, I usually get someone to come by and ask if there is anything they can set up for me to keep me in the casino, which is nice. So, I will be taking that $19.95 and NOT buying the book, and will likely be scoping out a good machine to drop that money in. I will just pray I do not get bonked over the head with a bar stool from a pit boss who is mad at my winning ways. So, I will be taking that $19.95 and NOT buying the book, and will likely be scoping out a good machine to drop that money in. You can lead a horse to water, but you can't make him drink. I hope you are never abused by casino employees. If you are, your opinion will change, and you will wish you knew your legal rights. I suggest we let this board sound off on how many times our rights are ruined by the casinos that hate us. I, for one, think that it is an area of concern that is so small in my life, as to be not noticed. So, attention all board viewers, please let us know if you feel intimidated, hated or otherwise harassed by the casinos, security personnel, police, Nevada Gaming Commission during your time at casinos. I fear more of the element that come to casinos that don't have strong management and security. This book just does not appeal to me, but I am sure if you are right, it will be a "best-seller" in short order. Bear, you're right about the policy of the board concerning advertising, but like all policies [should be], each case must be judged on its merit. Whether or not the book is an accurate representation of the casinos' attitudes, it represents one person's opinion, so is of interest to this board. A while back, Irishsetter asked to place an ad on visitreno.com to promote his dice setting seminar, for which he charged a fee. I didn't feel his advertising money would be well spent on a site that caters to mostly non-professional gamblers, and recommended he mention the seminar on the board instead. The post was well received and generated a fair amount of controversy concerning the efficacy of dice setting. If a product or service concerns beating the casinos or understanding how they operate, bring it on. 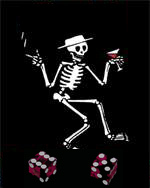 Posted: Jul Thu 27, 2006 7:59 pm Post subject: Casinos....Hate US??? Well, a few people know I spent 10 days in Reno/Virginia City over the 4th of July. I didn't file a trip report because I had nothing much worthwhile to say. And my Mother always said, "If you can't say anything nice, don't say anything at all". Most long time posters here know that I've sang the praises of Siena for several years. And on this trip, for the first time, I needed the help of Siena's Casino Security. You see, when I went out to my car in the morning, I had a broken tail light, and a fist sized dent in my rear fender. Later estimates would peg the damage at just under $ 1,000. With security cameras all around, I figured they would easily be able to review the security tapes and reveal the offending LARGE, WHITE pickup that was kind enough to leave his paint one foot above my taillight. The security cameras are for the security of the casino, NOT the customer. The head of security ignored my calls, and eventually made clear that the only way I could obtain the results of a tape review is by court order. I had to threaten contacting the owner or filing a lawsuit before I got any reply at all. Security was not only not helpful, but confrontational and adversarial from the get go. I would hate to be mistaken for a card counter here. I suspect this is the norm, not exception. It makes the allegations in this book's review very believable. Funny thing is, I can barely keep track of my own cards after a few drinks, let alone the entire deck. But this experience really soured me on casino customer service and security. After my experience with casino security, the stories in this book are easily believable. Final chapter: The head of "Human Resources" eventually sent me an e mail that said, " A review of the tapes reveals no evidence of any car other than the green Honda parking next to your car for the period mentioned". The cynical me thinks half of the cameras are either dummies or sweep with my car being out of frame, but they don't want anyone to know it. Of course that's just my OPINION, not based on fact. I would need a court order to prove my OPINION. I think this is common practice with private groups, whether it be a casino, a Walmart or a bank. Unless they are ordered to do so, or want to review to protect their interest, they don't get involved to limit their liability legally, which makes sense. I would think that you would file a police report, and the police would determine if they wanted to get with security at the casino and review the tapes. But in reality, they would say that you have insurance, it is a non injury event, your damage was not huge, so just handle it through civil courts or insurance. The casino does not want to be providing tapes and such for people to sue other people. They are bought specifically for casino use. If the police need it, that is a different story but that brings the police as the responsible agency for review of tape, and distribution of it to the DA office. Try to look at both sides of it. In a society where everyone seems ready to sue everyone, people are sporting video phones and cameras to record every perceived wrong, the last thing a private business wants to do is get in the middle of something that could tie them up and make them co-defendants in litigation. By the way, I am so darned happy to see a posting on something out of the ordinary for the site. It is good for discussion and good to get people thinking. For the most part, we liked the Tuscany. However, we won't be going back because of the way their security handled this whole mess. I have also taken every opportunity to leave messages on appropriate boards about this so that everyone will know how the Tuscany operates. It's funny, though: Had they shown just a bit of concern and had they been honest, we might have considered staying there again. Bad things have the potential for happening anywhere and, had they handled the situation a bit more diplomatically, we certainly would not have held the casino responsible. There were eight other couples in our party, all staying at the Tuscany and all of them have written the hotel expressing their concern over how the security force responded. Hopefully, they will get some kind of message from that. I can tell you for certain that I WILL be investing in this book. The common thinking is that the casinos do not hassle "average" patrons. For the most part, this may be true, but there are many examples of casino harassment of casino patrons who are simply on a winning streak. (BTW, Tuscany is rumored to be one of the worst offenders of this). Even if you're not an advantage player (and lvbear may not consider me to be an AP), I think this book will change your view of casinos. Forwarned is forearmed. Posted: Jul Mon 31, 2006 9:50 am Post subject: Bob Nersesian featured in today's"Nevadan at Work"
For many gamblers, Bob Nersesian is a saint who has come up a winner tackling the cases of advantage gamblers who claim their civil rights have been trampled by casinos. For some gaming executives, he's a scourge who's persuaded judges and juries to protect individual rights rather than the odds of the house over players.
" As a prospective jurror, can you be open minded and without prejudice in hearing the case of the lawyer vrs. the casino?" JD: No....I kinda hate them both. But I kinda use them both. But I still don't much care for them... except when they're good to me. Even when they don't intend to be good to me. Can the jury throw them BOTH in jail? I'll buy the book to make sure a casino pulls some of this stuff on me, then I'll have Nersesian represent me and I'll collect a million dollar settlement...a much more likely outcome than winning the Megabucks jackpot. As an aside, back in my early blackjack counting days, I was at Harvey's and I guess I was too obvious with my bet spread....on the next hand, they dealt to third base FIRST! I actually won my hand, but that got my attention and I got their message to leave the table. Moving in stereo...with no static at all. Q: Is this just happening to the professional gamblers? Should the mom on the dollar slots be worried? A: In my book there is a chapter titled "Finding a Nickel Brings Trouble," (about) what happened to Estella Romanski at the MotorCity Casino in Detroit. Romanski was taken to a back room and subjected to treatment that the courts found particularly reprehensible and egregious. This was a grandmother of nine playing nickel slots. This is not a Las Vegas issue, but an industry issue, and yes, "mom" can be brought into the equation. Most of the Reno casinos are less hostile than the typical Las Vegas casino, but beware -- it could easily happen in Reno. The Reno Cal Neva is sometimes particularly nasty when backing off a skilled player. Some of its guards have appeared to me to be on the edge of going out of control and committing violent crimes against a patron. Be careful there. This topic has been "beat" to death, but if you are in fear of casino management, casino security, Gaming Control Board, or anything related to casinos, just don't go. I see that your occupation is professional casino patron, so I guess that you don't dislike the treatment all that much, or you would change professions. I think that this issue is primarily yours, I have not seen an outpouring of other board members talking about how they got "worked over" in the back room of the Atlantis, so I am personally a bit tired of the whole discussion. The article you refered to was just as vague, with the attorney stating that cases highlighted are much rarer after the mid 90's, due to "six figure" judgements. If guards at the Cal Neva lose control and turn "nasty" there is always criminal and civil penalties to be extracted, as the attorney mentioned. Jury trials are not staffed with casino owners, and if the facts were such that you are innocent, I would trust the jury to determine that correctly. I personally feel that many of the patrons of the Cal Neva are the "nasty" bunch, and I am glad casino security is around to keep an eye on them. Casinos and their management have to deal with the entire gamut of humanity, and I don't envy them for that. They have a tough job, they make some profits, but not that much. If you think they do, buy the stock, they are traded on the NYSE in most cases. Also, they have everyone in their pockets, and that is the reason there is no state income tax in Nevada. They sponsor many charitable events for the local community. They do their best to keep the environment clean, safe, and entertaining. And, by the way, I don't work for the casinos. But I think you are giving a false impression of their behavior towards their customers. The article you quoted was just as vague, and the attorney has a vested interest in litigation against casinos, so I am sure he wants to corner the market on anyone who thinks they have been "wronged" by a casino. I think that if you read between the lines, his book, and self promotion is evident. Note that most of these links refer to Las Vegas cases. As I stated, Reno casinos are much less hostile. Spinner mentionend Atlantis; whenever I have been asked to not play at Atlantis, it has been done with class and dignity. I have absolutely no complaint about my treatment by Atlantis. I wsh Atlantis management would teach classes in Las Vegas about how to proftiably and ethically operate a casino. "By what legal authority do guards detain, handcuff or arrest anybody who has done nothing illegal and is in the process of leaving the premises? It doesn't exist," said Allen Lichtenstein, general counsel of the Nevada chapter of the American Civil Liberties Union. Clark County District Judge Lee Gates has unsealed a $400,000 verdict a jury made in favor of advantage gambler James Grosjean against the Imperial Palace in a wrongful imprisonment suit. The jury found the New Frontier, its security chief and a security guard liable for false imprisonment, assault, battery, intentional infliction of emotional distress and negligence. The effect of this ruling is that police officers are given carte blanche to make up reasons to arrest people in Nevada with impunity. Simply, police officers now have the discretion to knowingly lie in police reports, knowingly lie in bringing charges against citizens and force imprisonment without legal cause. Then, when the victim seeks justice, the police officers in Nevada can claim and receive immunity from the lawsuit. Imagine what would happen to this town's biggest industry if word got out that visiting players who break no rules or laws can be handcuffed, threatened and locked up for hours against their will -- with impunity -- for nothing more than playing card games well enough to win. A federal jury ruled in favor of three Las Vegas police officers Tuesday in a civil case filed by a professional gambler they arrested in 2002 at the El Cortez. The verdict was swift Dec. 13, less than three hours to decide that the guard and the Luxor should pay $203,230 and Mandalay Bay, which evicted her from her room after the incident at the Luxor, should pay $100,000. Then jurors went back to discuss punitive damages. The lasting impression this case leaves is one of egregious misconduct -- gratuitous abuse of power, sanctioned by a casino, that left a 72-year-old woman the victim of needless indignities and humiliation. In moral terms, the casino’s conduct was significantly reprehensible; it surely was reprehensible enough to warrant a substantial punitive damages award. A Nevada Gaming Control Board member is asking the attorney general for "guidance" about the limitations on the use of force by casino security personnel and the legal rights of advantage gamblers. But the gambler then filed suit against the resort, the Control Board and Hearn charging false imprisonment, assault and battery, and conversion and conspiracy. Over the past few months, Nevada regulators have ordered the MGM Grand casino to pay two gamblers whose chips were confiscated by the city's biggest gambling hall after employees said they couldn't verify whether the players had won them. Abuse of casino patrons' rights in Southern Nevada is actually more widespread than is commonly acknowledged. A Las Vegas attorney who has represented dozens of card counting clients filed another lawsuit Monday, this time to stop Nevada casinos from using a computerized card counting system that boosts the house's odds of winning at blackjack. EDITORIAL: Are gamblers being fleeced? The gaming industry's viability -- and the state's economy -- hinge on the premise that gamblers get a fair shake. Even the slightest hint that fancy shufflers and other glittering casino technologies can be used to swing the outcome of games is a black eye for Nevada. The Venetian agreed to pay $1 million in fines and investigation costs to settle a first-of-its-kind complaint that the resort had fixed promotional contests to favor specific Asian high rollers. An executive fired by The Venetian in connection with a 2002 contest-rigging scandal is working in a top job at a small Las Vegas casino. Two of the casino executives fired by the Las Vegas Strip's Venetian resort for their involvement in the rigging of three 2002 promotional contests are still working in the casino business. Executives of downtown's Golden Nugget casino have settled a three-count complaint filed last month by the state Gaming Control Board and would pay a $30,000 fine under a proposed settlement agreement. A sharply divided Nevada Supreme Court has given Nevada corporations further protections from civil lawsuits brought because of the wrongdoing of their employees. The court ruled Friday that the Gold Coast casino in Las Vegas was not liable for $372,000 in punitive damages awarded in the case of a black man who was severely beaten by security officers and victimized by racial comments while the sergeant-in-charge looked on. The ruling was the result of a 4-3 decision, and three justices who dissented had strong objections to the ruling. Payne said he believes his charitable act was turned into something sinister by a power-wielding security guard. Former Mirage Resorts Inc. corporate security manager Eugene Harding has pleaded guilty to a federal charge that he conspired with a government official to illegally access an individual's personal tax records while Harding was employed at the Mirage. Carey sued Agent Spendlove, the State of Nevada (the "State") and the Nevada Gaming Control Board (the "Board") under 42 U.S.C. § 1983, claiming that Spendlove violated his Fourth, Fifth, and Fourteenth Amendment rights by searching Carey's shoes without probable cause and by arresting Carey for refusing to identify himself. Carey also brought claims under state law for false imprisonment and battery. "The next thing I knew my sleeve was torn off as someone was pulling me to the ground," he said. "All I felt was someone grabbing the back of my head and someone else grabbing my feet. They were trying to pound my head into the pavement. I could feel someone big on my back with his knee. It came out of left field." The video includes frightening footage obtained from casino surveillance cameras of a law abiding, skilled player being handcuffed, forcibly backroomed and detained by casino employees.